Francisco Partners Makes Strategic Investment in Clinical Information Services Company Therapeutic Research Center - Berkery, Noyes & Co., LLC. 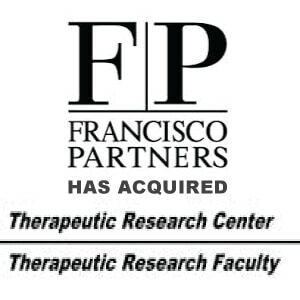 San Francisco, CA–Aug 13, 2012 – Francisco Partners, a leading technology-focused private equity firm, today announced that it has completed a strategic investment in Therapeutic Research Center, a leading provider of drug therapy recommendations, continuing education, training, and data to the healthcare community. Founded in 1985, Therapeutic Research Center conducts extensive research to synthesize the frequently changing and often unclear data on drug therapy into clear, concise, and unbiased recommendations for medical professionals. The company offers a broad portfolio of drug therapy advisory services, including Pharmacist’s Letter, Prescriber’s Letter, and Pharmacy Technician’s Letter. The company also offers an extensive set of accredited continuing education programs. Shearman & Sterling LLP acted as legal advisor to Francisco Partners. Berkery, Noyes & Co. served as the financial advisor to Therapeutic Research Center, and Choate Hall and Stewart LLP provided legal counsel to the company. Therapeutic Research Center is a research, analytic, and information services organization that provides evidence-based drug therapy recommendations for physicians, pharmacists, pharmacy technicians, and other healthcare professionals. The company also provides information on natural medicines to institutions and individual consumers. Therapeutic Research Center’s leading information products include Pharmacist’s Letter, Prescriber’s Letter, Pharmacy Technician’s Letter, Natural Medicines Comprehensive Database, Ident-A-Drug Reference, and a variety of continuing education and training courses. The company also operates Pharmacy Technicians University, an online education platform focused on the training and certification of pharmacy technicians. Therapeutic Research Center is fully accredited by every major continuing education accrediting agency for physicians, pharmacists, nurse practitioners, and physician assistants. For further information, please visit: www.therapeuticresearch.com.